The Ardh Kumbh Mela 2019 has begun today in Prayagraj. Starting on the auspicious day of Makar Sankranti, the religious pilgrimage will go on till March 4. The mass gathering of faith sees a huge number of Hindus gathering to bathe in the sacred river or at the confluence of Ganga, Yamuna and Saraswati rivers. Taking a dip in these holy waters will cleanse a person of their past sins. The Shahi Snan that takes place is one of the most important ones of the festival. Taking a dip in the holy waters will also release the person and their ancestors from rebirth and attainment of Moksha. There are specific bathing dates which hold more significance over others, these are the days of Shahi Snan. In the entire duration of the Kumbh Mela, there are three Shahi Snan and three other bathing days. Ardh Kumbh Mela 2019: Images of Naga Sadhus, ‘Kumbh Chalo’ Slogans to Adorn 1,600 Rail Coaches Run by Indian Railways Specially for the Holy Event. Depending upon the position of planets, religious beliefs, the arrival of seasons, some bathing dates are significant over others. A lot of beliefs culminate in deciding upon the Shahi Snan dates every year. From the first day of Makar Sankranti to the final bath on Mahashivratri, each day has a significance to it. 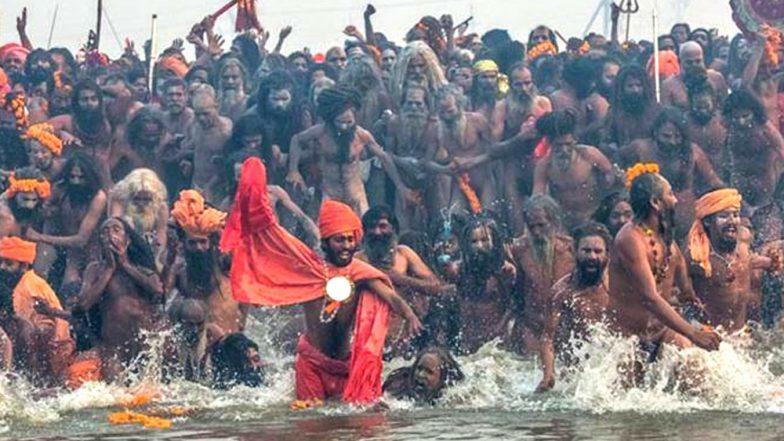 Let us look at the bathing dates of Kumbh Mela 2019 and what each of the days stands for. Kumbh Mela 2019 Tent City: Know Where to Stay and How to Book Tents in Prayagraj During Ardh Kumbh. The first Shahi Snan will be on January 15, which marks the beginning of this mass pilgrimage. January 15 is Makar Sankranti, when the sun enters the astronomical position of Capricorn as per the solar Hindu calendar. The belief prevalent among the people is that on this day the path from our Earth to other higher planets is open on this day. So it enables the souls to head towards their heavenly abode. The next important bathing date is on Paush Purnima, January 21, 2019. This day also sees a lot of devotees heading to temples for worship. It is the rise of the full moon and marks the beginning of Kalpavasa. Highest numbers of pilgrims come to Kumbh Mela Sangam on the day of Mauni Amavasya. It is a very auspicious day celebrating the birthday of Manu Rishi. This day is thus considered as the beginning of the universe. The planetary positions are said to be the most favourable on this day. The Basant Panchami or Vasant Panchami marks the beginning of the spring season. The change of seasons is said to mark the arrival of Goddess Saraswati, the goddess of knowledge. So people perform a Saraswati Puja after taking a bath in the holy waters. This day is called Maha Maghi and is associated with the worship of Guru Brahaspati. There is a belief that Hindu God of Gandharva travels from the heavens to the Sangam. Taking a dip in the holy waters on this day is considered highly auspicious. The pilgrims here experience the feeling of being in heaven in their humanly form on this day. The Hindu festival of Maha Shivratri honours Lord Shiva. It is the last and very symbolic day for the people who worship Lord Shankar. This day is said to be awaited even in heaven. It is the last day of the Kumbh Mela and the vibe of the place turns extremely religious. There is a lot of crowd who come here to experience the last day of the Kumbh. 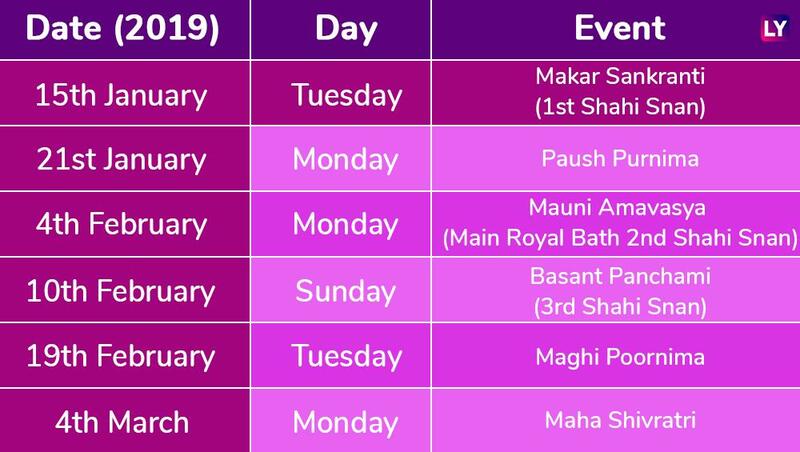 These are the main bathing dates in Kumbh Mela 2019. As you see each of the above days carries its own beliefs and importance. While Shahi Snan days remain a highlight of the festival, the other days too see a huge turnout of devotees, sadhus, saints and tourists alike. Along with the bathing ritual, there are many other cultural activities held which attract the tourists and people here.